To celebrate the upcoming fall season, I made this sweet little scarecrow card! I had so much fun bringing him to life and adding him to this card. The card base is 4-1/4 x 5-1/2 inches, top folding, in Mossy Meadow. I then added a layer in Crumb Cake that I ran through my Darice "Foilage" embossing folder. I made the piece 1/2 inch shorter than the green cardstock so the green would show below giving the illusion of the ground. The leaves are die cuts from Lawn Fawn, "Small Stitched Leaves", cut in various fall colors. 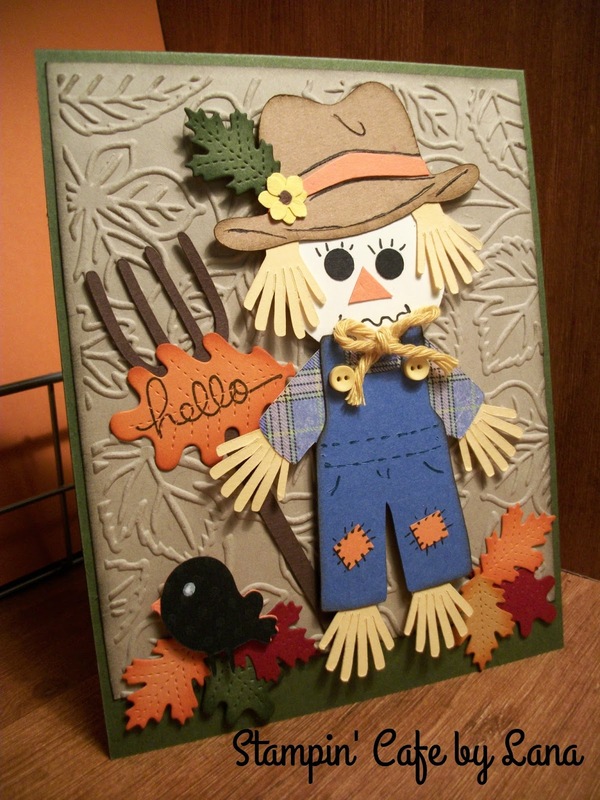 The scarecrow is made from the farmer on p. 68 of Cricut's Everyday Paper Dolls with the changes noted below. The entire scarecrow is made with Everyday Paper Dolls and the Create a Critter 2 Cricut cartridges. I will list all the cuts below so you can easily recreate your own scarecrow. Blackbird is cut from the bird on p. 36 of the Create a Critter2 cartridge, cut at 1 inch. I cut it twice, once in black and once in orange. I snipped off the beak on the black one and layered it on top of the orange bird to create the orange beak. Yellow flower on the hat is a small flower punch (two layered together) from a Martha Stewart punch. Patches on overalls are hand cut squares in orange, with added faux stitching in black ink. Leaves are all from the same leaf dies as mentioned above. I inked the edges in coordinating fall ink colors. I used a fine tip black journaling pen to outline some of the detail on the overalls and hat, and added stitch lines to the eyes and patches on his overalls. The "hello" greeting is from Endless Birthday Wishes by Stampin' Up, and is stamped on one of the larger leaves from the leaf die cuts. Helpful Hint: If you mess up the face like I did on my first attempt, you can cut off the head from the body and attach a 1-3/8" circle for the head instead. That way you don't have to start over with all your cuts! I hope you like this week's card and that you make a little scrarecrow of your own!